Easter is 1 of the 3 holidays my family celebrates with huge dinner’s. Each side of the family has their own traditional main dishes, side dishes and desserts. Of each course I think the sides are my favorite. Crazy, right? Like who wouldn’t claim desserts as their favorites! For me the Easter side dishes are what ties the entire meal together. 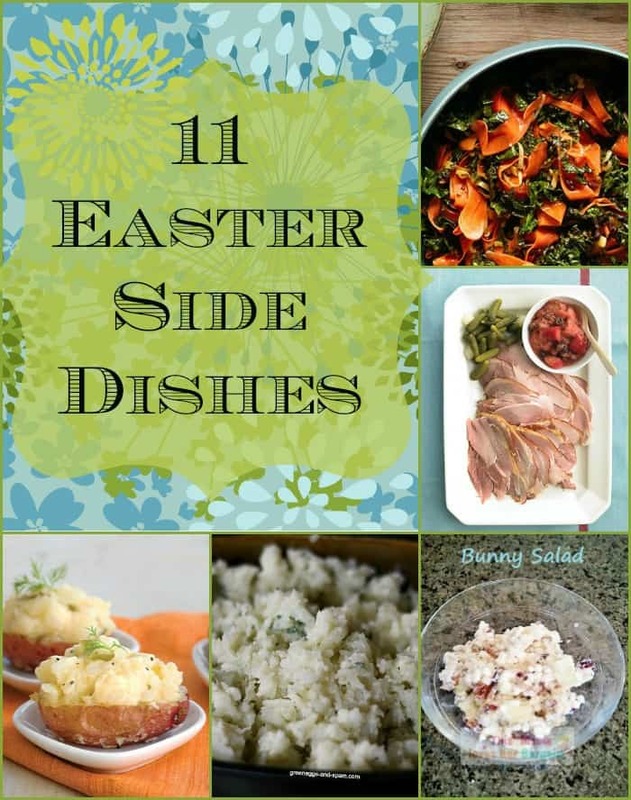 Since I’m all about trying something new things I’ve found 11 Easter Side Dishes to consider this year. I’m open to bringing others traditions and foods to my table and if you are too then you’ll appreciate this list! Empty Tomb Rolls from Clever Housewife – These sound divine and have a deep, spiritual representation. Sweet Potato Casserole from Susie B. Homemaker – I think Sweet Potato Casserole is the perfect side dish for every holiday meal! Gluten Free Mac & Cheese from This Flourishing Life – No family dinner is complete without mac & cheese! If you have gluten restricted guests this sounds like a great way to treat them. Mustard Potato Salad from Around my Family Table – Potato salad is a big thing around here, so I think my family would be interested in trying this. What about you? Bunny Salad from Mama Loves Her Bargains – No bunnies are harmed in the making of this salad! It actually sounds quite yummy – you have to check it out! Savory Mashed Cauliflower from Green Eggs & Spam – Savory is the only thing that saves cauliflower for me! Gingered Carrot & Kale Ribbons from Everyday with Rachel Ray – I can only imagine how the ginger brings this all together! Bunny Watermelon Salad – This is so incredibly cute. It doesn’t look that hard to carve the bunny from the watermelon either. Rhubarb Chutney – Hello rhubarb! What a wonderful accompaniment to a perfect dinner. Thanks so much for sharing my recipe! These all sound great! Mmm, I’m getting hungry for Easter dinner now! My family loves my sweet potato casserole (I get asked to make it every holiday, lol). I’ve always wanted to try making mashed cauliflower too so may add that as a side dish this year. And the deviled potatoes sound yummy!